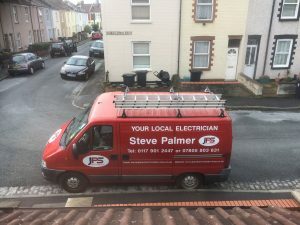 As an electrician in South Bristol and surrounding areas I am seeing a large increase in the number of households who use portable electric heaters. Used correctly, electric heaters can be a useful source of heating or additional heating for households who might only wish to heat certain rooms in their home. Electric heating comes in several forms; from fixed electric heaters, to portable heaters, some of which rotate in situ. However, as useful as they are, electric heaters also present serious electrical danger if used incorrect. They are also responsible for several fires that have caused death and serious electrical injury. Why are electric heaters dangerous? One of the major factors that affect the safe use of electric heaters is often the user. Yes, indeed. The way you use your electric heating determines your safety. Some people accidentally misuse electric heating and others are simply unaware of the risk they are taking. Some of the most serious methods of electric heating misuse I have seen in South Bristol and surrounding areas, the householder was aware of the risks they were taking. The most dangerous scenario I saw was the use of an unattended electric heater on a bed. I’m amazed the bed or the covers did not set alight. Not only was the bed at risk but also the heater could’ve tipped at any time and set other areas of the room alight too. It is important that electric heaters are positioned safely and not left unattended at any time. Believe it or not, the incorrect positioning of a heater is the main cause of house fire caused by electric heaters misuse. Never place an electric heater on as unstable surface. Placing electric heaters on an uneven surface or trying to balance it on other items in the room is a dangerous practice. Always ensure there is sufficient space around the heater so items around it do not set alight from the heat emitted from the heater. I recommend a space of 1 metre around the heater. Electric heaters can even set fire to wall paper that is coming unstuck from the wall. It only takes a small un-noticed thing in your home to cause a serious fire. Keep vents open and free of dust. Never be tempted to cover the vents on your electric heater even for a short time. I have seen vents covered with tea cloths and items of clothing countless times. Always check your heater for small objects that may have dropped through the vents before you switch the heater on. If you have small children, you will know what I mean when I mention the word ‘Lego’. Keep electric heaters away from extension leads. Electric heaters can quickly lead to overheating of extension leads which can also cause fire. As an electrician in South Bristol and surrounding areas I highly recommend that each electric heater that you use has a socket of its own. Never place an electric heater in a bathroom or around other sources of water. Water and electricity does not mix and can lead to electric shock and injury. Splashes from bath tubs, showers and sinks can cause serious electrical injuries. Use an electric heater safely and you can enjoy rooms that are heated on demand. Less money will be wasted heating empty rooms. Electric heaters heat up a room quickly and are perfect to use in a conservatory, study or a spare bedroom. If you have been using an electric heater incorrectly and are concerned that you may have caused damage to you home electrics, then please contact a qualified and registered electrician who can investigate further.